Bitcoin a new future – everybody can send and receive digital money, essentially, that you can create on your computer. Simple like iOS, yet powerful like a Mac, this application provide you all the options. 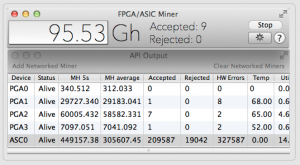 Friendly GUI and best mining software for Mac. This gives you the flexibility to choose whichever runs faster for your setup, whether you’re CPU, GPU, FPGA or ASIC mining Bitcoin, Litecoin or any compatible Alt Coin – including DogeCoin, VertCoin, QuarkCoin, and MaxCoin.